Although we tend to think of scorpions as inhabiting desert areas, there is a species of scorpion found primarily in western North Carolina. 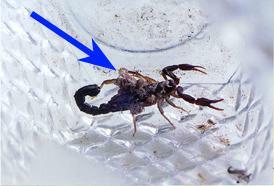 Vaejovis carolinianus (Figure 1, Figure 2), more commonly called the "southern unstriped scorpion" or "southern devil scorpion." Its body is more uniformly brown and about one inch in length when fully grown. This species is found in the southeastern United States on up into Virginia and central Kentucky. In North Carolina, it has been found primarily in the western area from Cherokee County to Polk County. However, it has been reported in other areas of the state as well. Other scorpions, particularly the striped bark scorpion, Centruroides vittatus, and the Hentz striped scorpion Centruroides hentzi, have been introduced accidentally with the movement of items from their native areas and could become established in other areas of North Carolina. Figure 1. Southern devil scorpion, Vejovis carolinianus. Figure 2. Female scorpion carrying offspring. Scorpions are normally found outdoors under the loose bark of trees and logs or under logs and stones on the ground. 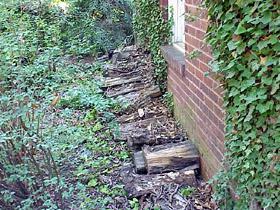 Around homes, they prefer wood piles (Figure 3), crumbling stone, brick foundations, or possibly inside the crawlspace of a house, particularly if old building materials like lumber are stored there (and the scorpions "hitch-hike" on them). 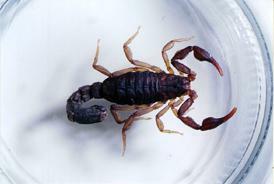 The diet of scorpions normally consists of insects, millipedes, spiders, and sometimes very small reptiles. Although we generally associate scorpions with dry desert-like conditions, the southern unstriped scorpion is usually found in very moist areas because that is where their prey is found. Many people become alarmed when they see a live scorpion scurrying across their carpet or find a dead one in their closet or behind / under furniture. Dead scorpions are found in recessed ceiling lighting fixtures in a home usually as a result of infested items being moved into an unfinished attic. Scorpions prefer to live outdoors. However, they may survive (and thrive) indoors if they find suitable prey. Scorpions are more likely to be found in areas that are moist or humid, such as bathrooms, kitchens (near the sink), or in a laundry room. They may enter homes through openings around plumbing fixtures, loose fitting doors and windows (Figure 4), or through existing cracks in foundations and walls. Figure 3. Woodpiles make an attractive habitat for scorpions. Always wear gloves when handling firewood. Figure 4. Scorpions can crawl through gaps around doors and enter crawlspaces. Unfortunately, the sight of one scorpion often sends people into a nervous panic. Although the southern unstriped scorpion can sting, it is not considered to be a public health threat except possibly to individuals who are allergic to other arthropod venoms or have other health issues. However, the sting of a scorpion is painful, so people that have sighted a few in their home may want to take some simple precautions. The easiest step to take is to vigorously shake clothing before wearing. Shaking is particularly useful with shoes stored in a closet or workboots left outdoors on porches or steps. Scorpions tend to be more active at night so beds should not touch the room walls. In houses where scorpions have been seen before, individuals should not walk barefoot at night. Find their hiding places both indoors and outdoors. Inside the home, you can expect them to be hiding in dark areas. Carefully remove items from cabinets (e.g., under sinks) and the floor of closets and inspect the areas carefully. If you have found several scorpions indoors, it is a good idea to wear garden gloves when removing items for inspection. You can also use glue boards (the same type used for mice) in closets and under sinks to monitor for scorpions. Outdoors, get rid of piles of debris outside where scorpions, spiders, and other pests may hide. Check around rock piles. Stones used for landscaping or bark mulches can occasionally harbor scorpions. It is a good practice to check firewood before bringing it indoors as well. Always wear gloves when handling firewood or cleaning up debris piles. Seal openings around plumbing fixtures with foam insulation, repair loose fitting doors and windows, caulk cracks in basement walls and foundations, remove stored building materials in the basement or crawl space, and remove debris, including firewood stacks away from the house. Control of scorpions by chemical methods can be difficult and thus is the least preferred route to take. The reason insecticides do not work well is because scorpions can survive for several months without feeding. Scorpions have been known to live for six months without food and water and may hide for two months after feeding. Therefore a product with a long residual action is needed to await their emergence. Several insecticides have some effectiveness against scorpions and are available for consumer use. The following are some examples. However, the most effective and safest applications are probably best performed by a licensed pest management professional. Indoor treatments should be directed to the baseboards (a "crack & crevice treatment"), corners and closets where the scorpions (and their prey) might hide. Extreme care must be exercised when spraying in a confined area like a closet or where food and cooking surfaces or utensils could be contaminated. 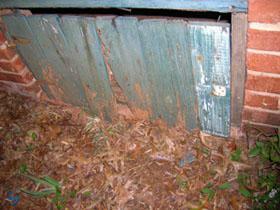 Exterior treatments should include spraying the foundation and around doors, windows and other possible entry points. A general treatment of crawlspaces is typically unnecessary with isolated occurrences of scorpions and is probably best left to professionals if you want one done. Shelley, R.M. and W. D. Sissom 1995. Distribution of the Scorpions Centruroides vittatus (Say) and Centroides hentzi (Banks) int he United States and Mexico (Scorpiones, Burthidae). Journal of Arachnology 23:100-110.